In building this vehicle it was ensured that every environmentally friendly attribute is also a custom attribute, as this is a fully customized vehicle. The completely rebuilt engine is a big block Ford 460 with Edelbrock aluminum heads, a tunnel ram, dual liquid propane carburetors many other high performance modifications. What sets this engine apart from many others is the fuel; it runs on 100% liquid propane, which creates next to zero emissions and produces equal to more horse power than pump gas (450 horse power)! Furthermore this extremely beautiful paint job is done with PPG’s Vibrance Envirobase Paint, which offers PPG’s awesome Vibrance colors in a completely VOC compliant paint system. Other environmentally friendly attributes include nitrogen filled tires by Nokian; Nokian is the worlds first tire manufacturer to introduce a production method using earth friendly oils, which means that they are free of toxic chemicals. 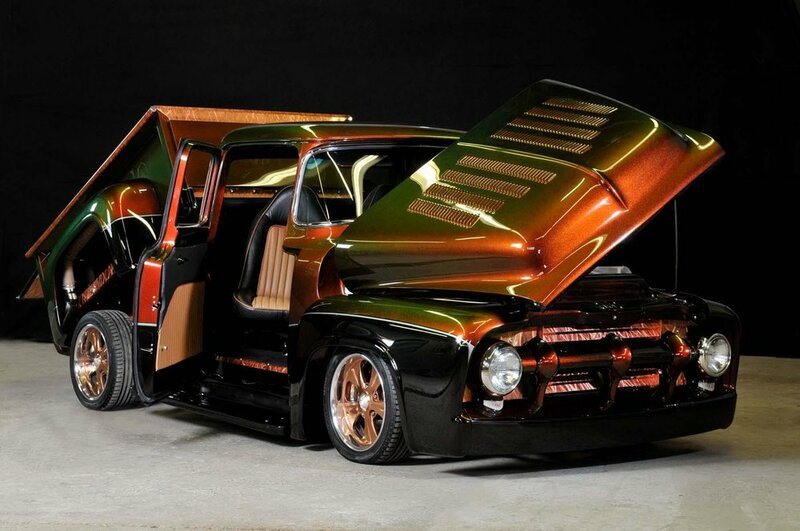 The truck has handmade copper bedsides & copper bed floor (underneath of bed floor), copper interior trim, a copper grille and a copper engine bay. All of the copper is made from 20 ounce copper sheets from Revere Copper Company (who utilizes 95% recycled material in their manufacturing process).! 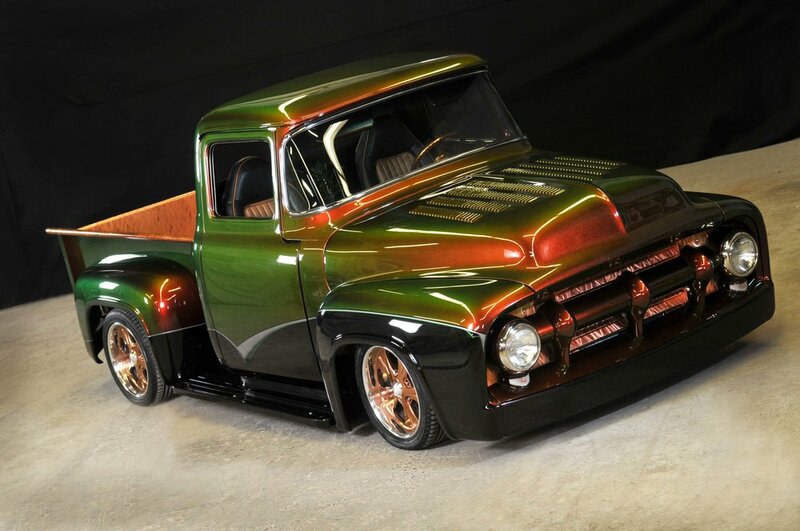 F-100’s, a 1956 Ford F100. DVD screens, 1 in each sun-visor and 1 in the dash. column which is painted to match the truck. copper panels that trim the box sides. The truck can be shown with its custom built display. The display includes: copper covered light boxes, copper tubing side rails, copper side panels, which encircle the podium that the truck is parked on, 3 mirrors that fit inside the podium, and complete black carpeting (which is even made from recycled bottles, to add to the theme of the truck).